Running a company can generate a lot of stress. It’s a good thing that Hayley Nichols, Founder and Principal of Allovus Design, has a great way to let off a little (or a lot) of steam. 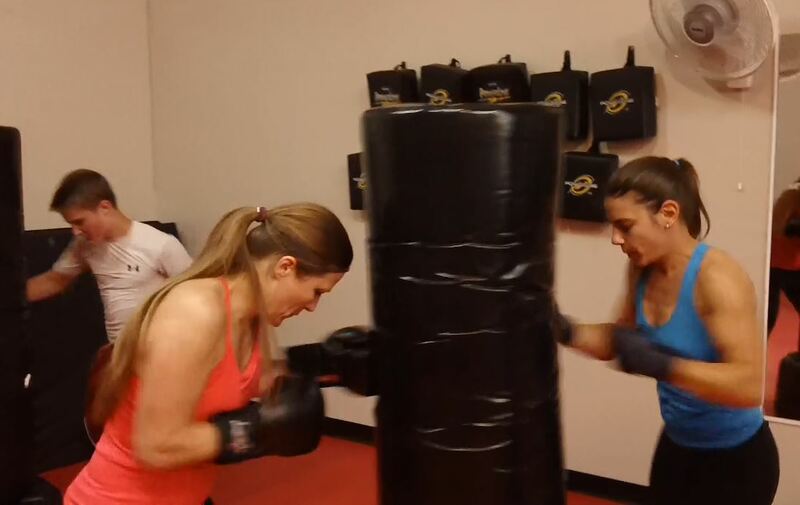 Two to three times a week, Hayley, Karen Walker (Allovus employee), Christy Burdyshaw (photographer at Allovus events), and Hayley’s son, Tyler, meet at I Love Kickboxing to knock out the stress. Allovus: What made you decide to try kickboxing? Hayley: I think there is a deep place inside of me that needs to release stress, and this is a great and fun way to do just that. I know many people love to get up and dance; that’s not my thing. But this is my thing and I love it! I always wanted to try kickboxing. I am not coordinated and have very little grace, so aerobics was never for me. Secondarily, I have said my whole adult life, I want to learn self-defense; I’m going to take a class and never did. A friend of mine found this three class special and a few of us went together to try it out. I figured I could do three classes and it wouldn’t be too risky. It clicked instantly with me. I wish I had done it twenty years ago. Allovus: How long have you been taking this class? Hayley and Karen: Just a little over a year. Allovus: What’s the best part about Kickboxing? What do you like about it? 1. Provides me with some self-defense training so I feel confident and more sure of myself. 2. Keeps me in shape and provides a fun way to exercise. 3. Amazing stress relief; I can’t hold on to all the worries, it forces me to let it all out. 4. Provides an outlet for self-expression; I am new to this world and it’s proving to give me confidence in other forms of expression as well. 5. My teenage son, Tyler, also loves Kickboxing. This is something we do together and it is important to have something we can stay connected with. 6. I get to spend time with my friends Karen and Christy, such lovely ladies, who are equally as passionate about kickboxing. Karen: Kicking someone in the head, well at least being able to kick the bag at ear level. Allovus: Do you have any funny stories associated with Kickboxing you’d like to share? Hayley: I’ve punched myself once, my son, and probably Karen a few times; all on accident of course. Sometimes Christy, Karen and I get in trouble for socializing in class. But Zach and Jeff don’t mind so much because we bring so much personality to the class. 😉 I get to feel like a kid for a bit, and focus on myself for a short period of time. This is a rare thing for me these days as I try to grow Allovus into a successful company, and raise two kids with my husband. Karen: I like kicking people in the head… LOL, no but really… one day we get to practice on Zach wearing a protective suit and I can’t wait! If you would like to try kickboxing, take a look on the I Love Kickboxing website and type in your zip code to see if there is one near you. http://www.ilovekickboxing.com/. Here is the website of the studio in Gig Harbor, WA. http://www.gigharborkarate.com/about.php. Tags: Allovus, exercise, kickboxing, stress relief. Bookmark the permalink.